Greetings friends and fellow crafters. I wanted to post a card today for the Joy Clair March Challenge. The theme is Anything Goes. I realize to many this looks like it should have been last month for Valentines Day, however, my husband and I will be celebrating our 5th Wedding anniversary later this month, and so I am recognizing that here today. 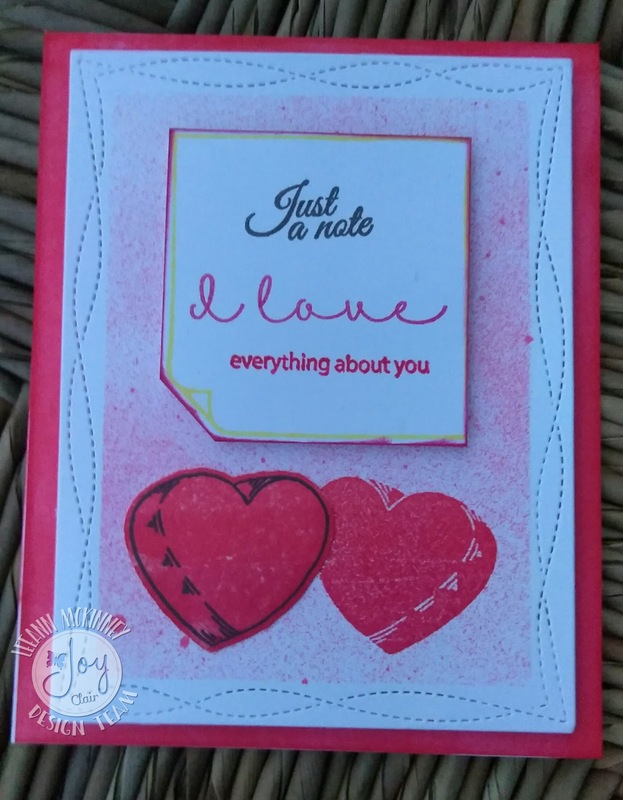 To make this card I used the Candy Hearts, Bible Planner, Hugs and Smiles, and the Everyday Sentiments Stamp Sets. I started with cutting the base with my Wonky Stitches die set. I then taped off inside the stitches so they would show and spritzed with AMuse Splash Spray!!! Upon removing the tape I was able to stamp the right candy heart, the left heart and post it note were cut with the SVG file and adhered with dimensional dots. Just a Note came from the Everyday Sentiments Set, the Post-it Note came from the Bible Planner Set and the I love everything about you came from the Hugs and Smiles set. I really had fun making this card and hope you like it too. Please link up and join the March Challenge. More information can be found here. Happy Anniversary!! Your card is so pretty! I love the sentiments you used! This is so beautiful, LeeAnn! Just perfect to celebrate your special day. HAPPY ANNIVERSARY! Happy anniversery! Love your card! Wishing you many more happy years together!!! !